Have you noticed it's a little warmer outside these days? Things are looking a little greener and I keep hearing more and more little birdies chatting it up outside my kitchen window. It's really starting to feel like spring! In honor of this lovely weather, I'm launching a "Meat-Free Grilling Series", which will include my favorite vegetarian and/or vegan recipes suitable for the grill. Over the next four weeks, I'll share tips, drink pairings, and more - so stay tuned! First up, of course, has to be the veggie burger. This is one of my favorite recipes and is modeled after the best veggie burger in the entire universe, which I originally found at Hillstone in Denver, CO but can also be found at R+D Kitchen in Santa Monica, CA. The patty is made from brown rice, almonds, mushrooms, fennel, and other veggies - the toppings and the brioche buns certainly add to the decadence, too! Side note: this veggie patty is gluten-free. 1. Preheat oven to 350 degrees (I do this in my toaster oven, but if you don't have one then your wall oven is fine). On a sheet pan, spread rice into one layer and bake for about 10 minutes, being sure to turn it about every 2-3 minutes. The point of this is to toast/dry out the rice so the patty isn't a soggy mess. You should notice the rice becoming a little bit drier every time you toss it around. If it still feels extremely moist, bake it an additional few minutes. Set aside and allow to cool. 2. Heat oil in a large skillet over med-high heat. Add the onion, fennel, carrot, mushrooms, and jalapeño or bell pepper. Sauté until golden brown. Drain veggies on a kitchen towel or paper towel (to drain the excess moisture and grease). Set aside and allow to cool. 3. In a small heat-proof bowl, add the raisins and 1/2 cup boiling water. Allow to soak for at least 5 minutes, or until raisins are softened and slightly plumped. Drain. 4. In a large bowl, mix the rice, vegetable mixture, egg, rice flour, almonds, raisins, chives, 1 tsp. vegan Worcestershire sauce, salt, and pepper. Mix thoroughly, preferably with clean hands. Form the mixture into a small ball - if it holds together well, it's done. If it's too soggy and falling apart, add a little bit more rice flour. 5. Form into 4 large patties or 8-10 slider patties. If grilling, it is best done on a sheet of aluminum foil sprayed or brushed with oil. Or simply cook in a cast-iron skillet on med-high heat. Ensure that a nice golden brown crust has formed before flipping - otherwise you may lose some of the patty in the flip. Don't forget to top with your favorite mild white cheese once you flip it over! I love to top the burger with a light drizzle of the Worcestershire sauce - it adds a great depth of flavor, fresh arugula that has been lightly dressed with freshly-squeezed lemon juice and some black pepper, sliced avocado, and sliced red onion. On a homemade brioche bun, YUM! I love baking bread, but serious bread baking also includes serious recipe testing, which is best left to the yeasty experts...like Tartine Bakery's recipe for my favorite crusty country loaf (still the best bread I've ever baked at home!) or this recipe, found in the New York Times, for heavenly brioche burger buns. Sorry, vegans. 1. In a glass or ceramic measuring cup, combine the water, milk, yeast and sugar. Let it stand for about five minutes, or just until you see it becoming foamy. 2. In a large mixing bowl, combine the bread flour, all-purpose flour, and salt. Add the butter and, with your fingers, break the butter into small pieces, forming crumbs. Add the yeast mixture and one beaten egg. Mix together until a dough forms. 3. Using a dough scraper, scrape dough onto an unfloured surface and knead for about ten minutes, or until it's smooth and elastic. 5. Divide the dough into 8 equal pieces and form each piece into a ball. Arrange these balls on the baking sheets 2-3 inches apart and then let them rise, covered loosely with a kitchen towel, again for 1-2 hours. 6. Fill a large and shallow baking dish or pan with water and set it on the bottom oven rack. Place another rack in the center of the oven. 7. Preheat the oven to 400 degrees. Lightly beat the remaining egg with 1 tbsp. of water and brush this egg wash on the buns. If using, sprinkle sesame seeds evenly over buns. Bake the buns for about 15 minutes, or until nicely golden brown. Rotate baking sheet halfway through the baking time. Instead of adding sugar syrup (because I prefer dry sangria), I like to take fresh ripe berries (ripe = more sugar), like strawberries and blackberries, and muddle them a bit to release their juices, then I add a bit of orange juice to the mix. I always always always add sliced citrus (limes + lemons + oranges) to my sangria. It looks gorgeous and adds an irreplaceable brightness. If you have an apple, chop that up and throw that in there - why not? Make it a project and find your perfect sangria recipe! Taste as you go along and I guarantee you'll come up with something amazing. In a large jar or pitcher, add the berries and muddle or crush to release their juices, but not turn into complete mush. Add the red wine, brandy, Port, orange juice, sliced citrus, and mint leaves. Stir to combine. Allow to sit, covered, in the refrigerator for at least 3 hours or, preferably, prepare in the morning to enjoy in the evening. To serve: Stir before serving. Ladle fruit and liquid over ice and garnish with an orange slice and/or fresh mint leaves. Note: I keep my sangria in an airtight glass jar and vigorously shake it a few times per day as it sits. Always do a taste test. Not sweet enough? Add some sugar syrup or a splash of fruity dessert wine, if you have it open. Not boozy enough? Add some more brandy. The first time I had this crab toast, it made me very, very, very, very happy. It was SO hot outside. A big pitcher of sangria was in the process of cooling me down. And then this crab toast shows up at the table. It was garlicky, bright, fresh and satisfying. Every few months, I have an irresistible urge to make it at home along with a pitcher of sangria. It's simple and easily made ahead for entertaining later. 1. Drain the crabmeat and sift through it to pick out any pieces of shell. In a medium bowl, add the crabmeat, olive oil, 1 tsp. sea salt, paprika, black pepper, lemon zest, lemon juice, chives, and thyme. Stir to combine. 2. Drain, rinse, and dry the piquillo peppers. Stuff each pepper with enough crabmeat to fill each pepper loosely. If you're making ahead, you can set the stuffed peppers upright in a bowl and cover with plastic overnight. 3. In a mortar and pestle, crush 3-5 garlic cloves (depending on your garlic tolerance and the size of the garlic cloves - I usually use 3 large cloves) with salt until it forms a paste. Add the mayonnaise and stir to combine. If making ahead, you can also keep this in a bowl, covered overnight. If you don't have a mortar and pestle, grate the garlic into a bowl and just stir in the salt and mayonnaise. 4. Slice the baguette into twelve 1/2-inch slices, or slice an equal number of bread slices for the number of stuffed peppers you have prepared. Toast the slices in a toaster oven until golden brown or, if using your regular oven, place sliced bread on a sheet pan and bake at 400 degrees for about 10 minutes. To assemble: Spread about one tablespoon of garlic spread onto each piece of toasted bread. Place one stuffed pepper on top and garnish with a bit of chopped chive. Enjoy! Simply pour one ounce of Amaro Montenegro into a Champagne flute or coupe and fill, to your desire, with sparkling wine. Garnish with some fancy lemon or orange peel or just a thin slice. Vegan baking can be a little temperamental, but these butter-free shortbread cookies came out better than I expected! Be sure to use refined coconut oil since it has a neutral taste - if you don't mind having a coconut flavor in your cookies, go ahead and use unrefined or virgin coconut oil. 1. In the bowl of an electric mixer, beat the coconut oil until completely smooth. Add the sugar and mix on medium speed for about one minute. 2. Add the lemon oil, lemon zest, lemon juice, chamomile, vanilla extract, and salt. Mix just until combined. 3. With the mixer on low, slowly add the flour 1/3 cup at a time. As with pastry and pie doughs, the amount of flour needed can vary. You don't want the dough to be soft and wet, but you also don't want it to be dry, crumbly, and falling apart. If it's too wet, just add a bit more flour. Too dry, add a little bit of water or even some more lemon juice. 4. Turn the dough onto a lightly floured surface and bring the dough together in a 2-inch thick log. Wrap the log tightly in either parchment paper or plastic wrap, making sure to twist the ends. 5. Refrigerate for at least 30 minutes. The dough is ready to bake when it feels firm to the touch. You should be able to squeeze the dough log without making much of a dent and it should be easy to slice. Slice into 1/3" cookies and place on a parchment-lined baking sheet, about an inch apart. Bake for about 15-18 minutes or until the edges are lightly golden brown. You should get 14-16 cookies total. A Dozen Beautiful Wines to Welcome Spring! Spring has sprung, the grapevines are getting greener by the day, and it's about time to pop some corks! The bounty of beautiful vegetables at the farmer's market has forced me to fire up the grill and lounge in the sunshine with a glass of something light, with refreshing acidity and great balance. White wines and rosés are always popular this time of year, but young, lighter red wines (like Chinon, Zweigelt, Gamay, or Pinot Noir) would be perfect, too! When choosing reds, try to find young wines with higher acidity and little to no oak. Also, remember to serve light red wines slightly chilled for some added refreshment! This New York sparkling wine is refreshing and citrusy - perfect for a toast or celebration on its own, or paired with aged cheeses and meats. Nothing better for a summer day in the Hamptons! Wiemer also has exceptional Riesling - some of the best in the United States! Some people always have a bottle of Veuve Clicquot in their refrigerator, awaiting the proper ocassion - I always have Domaine Carneros. One of my favorite California sparkling wines, it's a versatile sparkler that is perfect to bring out each and every weekend! Pairs beautifully with briney oysters, ceviche, and even rich, creamy French cheeses. I'm not always a fan of Chenin Blanc, but Molly Chappellet's signature wine offers refreshing, lively notes of citrus and tropical fruit. Its richness and moderate acidity pair beautifully with white fish, chicken, and fresh cheeses...the perfect wine to enjoy while taking in a California sunset. Grüner Veltliner, the star of Austria, has grown in popularity over the past few years. When you can't make a choice, choose Grüner Veltliner! It is versatile, bright, and pairs with a number of light foods like spring soups and light vegetable dishes. Viognier, one of the Rhône Valley's best known grapes, thrives in Tablas Creek's certified organic estate vineyard. Wonderful with or without food, this Viognier has a rich mouthfeel and is bright and clean on the palate. Pair with grilled white fish, shellfish, and salads with bright citrus dressings. This Sauvignon Blanc from the Loire Valley is beautifully aromatic - fresh, with bright acidity and gentle minerality. The famous limestone soil is evident in the glass. Pair with white fish and use a splash to make an accompanying sauce! This Sauvignon Blanc comes from a certified organic vineyard in Colli di Orientali, located in Northern Italy. This area is known for its crisp white wines and this bottle is no different. It is medium-bodied with a punch of citrus and stone fruit - perfect with light hors d'oeuvres and grilled fish. Nothing says summer like a group of girls toting a bottle (or five) of rosé to the beach - from city to city and country to country, the tradition lives on. Lorenza's rosé is a pretty perfect dry Provençal rosé - made right here in California. It's a great summer sipper. Gamay may be known as the grape that makes up Beaujolais Nouveau, but trust me, Gamay is so much more than that! These light red wines from Burgundy and the Loire Valley also thrive in Oregon's Willamette Valley. Earthiness and soft red fruits lead to a bright, balanced finish. Pair with grilled salmon. One of my favorite local wines, this Pinot Noir is easy-drinking, light, and fruity with a hint of spice on the palate. I drink it all year round as a go-to light red with vegetarian pasta dishes, but it also pairs exceptionally well with grilled salmon. Oregon's Willamette Valley is one of the best expressions of Pinot Noir in the country and Penner-Ash has some exceptional options. One of the more expensive wines on the list, this Pinot Noir is rich with red berries and cherries on the palate. It also carries a longer finish than the one above. Pair with grilled salmon and lighter meat dishes, like chicken and pork. Chinon is usually going to mean Cabernet Franc and Domaine Bernard Baudry is one of the best producers in the Loire Valley. There are some great examples of Cabernet Franc in California (try Chappellet's Cabernet Franc from the Napa Valley), but Chinon is famous for its bright acidity and that's what this classic example showcases. It is fruity and slightly smokey, perfect with a hefty cheese and charcuterie board. It's hardly a surprise that San Francisco offers delightful culinary experiences around every corner. The tough job might be actually choosing from the long list of great restaurants! The Ferry Building was built to be touristy - and that's perfectly fine - but it has some delightful things within its walls. One of the first things I do every single time I'm in San Francisco is walk to the Ferry Building to find a seat at Hog Island Oyster Co.'s oyster bar. The view + the fresh oysters + the slight chill from all the ice behind the bar is sort of meditative. When you're done, go walk around. Have some organic soft-serve from Strauss Family Creamery (how often can you find organic soft-serve? Answer: almost never. ), order coffee from the secret counter at Blue Bottle Coffee and then simultaneously eat your soft-serve and drink your coffee while you wander. If you need something a bit more savory, head over to Chris Cosentino's Boccalone for a meat cone (if you appreciate the use of the whole animal, be sure to get some fresh local lard soap from Boccalone as well) and then grab some local cheese from Cowgirl Creamery. Chinatown is also touristy, but there are some hidden gems. It's absolutely worth the time to stick your head into a few shops, smell all the dried seafood, and pick up a steamed pork bun when you get hungry. Tartine Bakery has an excellent reputation for good reason - their tartine (open-faced sandwiches) are delicious and their breads are phenomenal. In fact, their bread book is my bible. Do not go here on a Saturday or a Sunday unless you want to wait in an obnoxious line. The obnoxious line wouldn't be so bad if you could hold your place and run across the street to the city's best knife shop and sharpeners at Bernal Cutlery. Bar Tartine, a formal restaurant instead of just a bakery, is one of my favorite spots for snacks and a glass of wine...my only complaint is that they aren't open for lunch. If you have any desire to visit one of the best cookbook stores in the world, be sure to stop by Omnivore Books on Food. 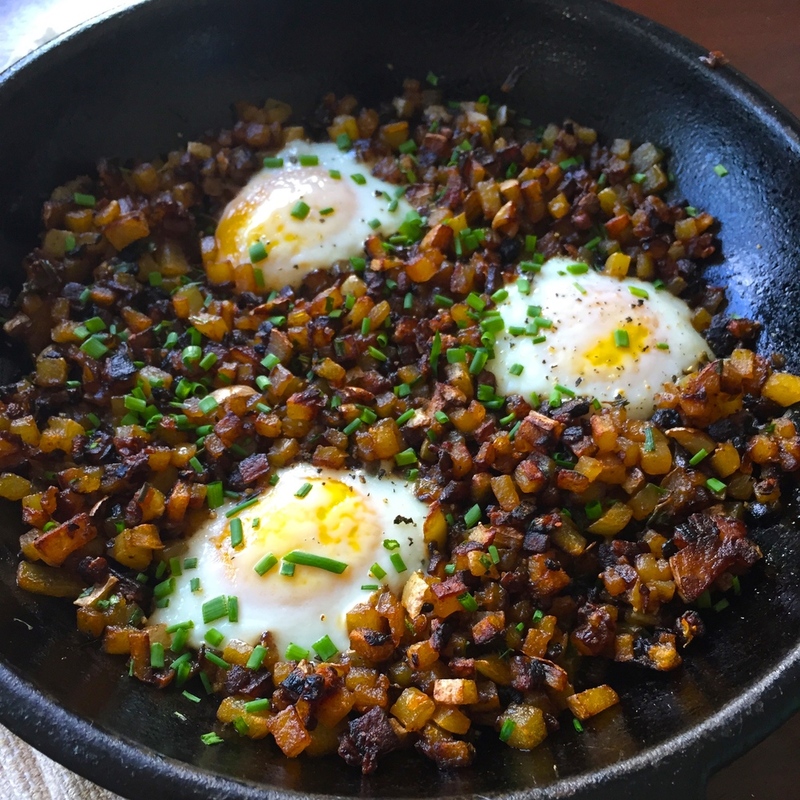 Nopa is very recognized as one of the best brunches in town. If, like me, you don't plan brunch dates decades in advance, you might have to forego snagging a reservation at Nopa and settle for Foreign Cinema. Their avocado toast is one of my favorites, but it's hard to go wrong with most of their options. For dinner, check out the brand spanking new Cockscomb, which is Chris Cosentino's latest project. The food here is simple, unpretentious, and mostly wonderful. I would eat the Celery Victor everyday, if I could! 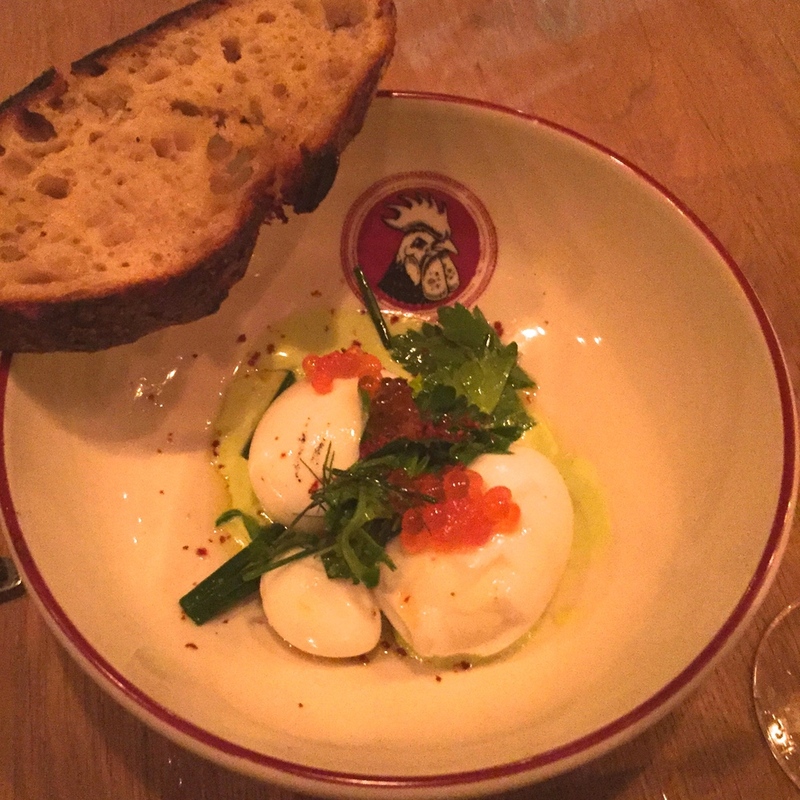 Other favorite dinner spots are State Bird Provisions and Commonwealth for consistently delicious food. I do love A 16 for their pizza and appetizers - not even their inattentive service or snooty hostess(es) make their food taste any less delicious! If you're celebrating and want to go somewhere special (read: fancy), Quince is still at the top of the list, as far as I am concerned. My last dinner recommendation is a hipster sushi joint on Mission Street. I can't say that I even had an interest in hipster sushi, but I went here on a whim and didn't regret it. Ichi Sushi and Ni Bar takes sushi to another level. Allow the chef to take you on a journey - order omakase and enjoy! San Francisco knows how to do cocktails. Bourbon & Branch is the perfect place for a mustachioed cocktail, but do yourself a favor and book a reservation at Wilson & Wilson instead - it's a speakeasy within a speakeasy! (Wilson & Wilson is located within Bourbon & Branch). Local Edition and Rye are equally boozy options that will not disappoint. Grab Your Cast Iron: "Skillet, a Love Story"
A lot of people have this love/hate thing with their cast-iron cookware. Maybe you thought they were kidding when they said "don't put it in the dishwasher" and you ended up with a rusty problem on your hands. If this is the case, please forgive and forget. Pull out your cast-iron pans and create some happy memories. Or maybe you're like me and you love your cast-iron skillet so much that you use it almost exclusively! Deep down, you know it's the pan for you...it goes on the stovetop, into the oven, and onto the table! It fries your chicken, sears your steaks, and bakes your cakes! Did you know: a cast-iron dutch oven is the secret to baking breads at home with an amazing crust. It retains heat, cooks evenly, and, if well-maintained, will last longer than you. Suddenly, I imagine the moment when my future child goes off to college and I pass an old cast-iron skillet onto the next generation...a special moment, right? Cast iron can be purchased from most hardware stores, quite affordably. I love the trusty old Lodge brand (for both cast iron and seasoned carbon steel), but if you want to be fancy, head over to Williams-Sonoma and blow a few thousand dollars on the entire line of Staub cookware (coincidentally, also making you my new best friend). It's hard to say which dish I cook more often for breakfast: frittata or baked eggs. Both are one-pan, easily assembled and prepared dishes. I already shared this recipe for Baked Eggs here, which I use adorable little single-serving Lodge skillets for. This recipe is the same idea, but the eggs are baked on a bed of breakfast potatoes in a large cast-iron skillet. Heat the olive oil and butter in a 9-inch cast-iron skillet, then sauté the potatoes and onion - with about one teaspoon of salt - until golden brown and crisp. Add the garlic and cook for less than one minute, just until cooked through. Remove from heat. Add the thyme leaves, paprika, some freshly-ground black pepper, and 1 tbsp. of chives. Stir to combine. Turn your oven's broiler on or heat your oven as high as it will go - usually 450 or 500 degrees. Make 2-4 little indentations in the potatoes - this is where each egg will be placed and will allow it to stay whole instead of spreading all over the pan. Place an egg in each little bed you've created. Put the skillet under the broiler for about 5 minutes, but check the eggs after 3 minutes. The yolks should be soft and the whites cooked through. Remove from the oven and sprinkle the rest of the chives over the top. Serve in the skillet and enjoy! I hesitate to use the term "pot pie" because it's usually associated with lots of cream and butter. Other than the puff pastry on top, this vegetable stew doesn't rely on an excess of fat to make it tasty - it's heavy on the vegetables and on the flavor. Heat 2 tbsp. of the olive oil in a large cast-iron skillet on med-high heat. Sauté the onion, carrot, fennel, mushroom, and Brussels sprouts until soft and golden brown. Sprinkle a bit of salt over the vegetables while cooking. Add the peas, asparagus, broccoli, cauliflower, and 1/2 cup water. Place a lid on the pan, lower the heat, and allow to steam until the water has evaporated and the vegetables are cooked, but still firm - about 2 minutes. Return the heat to med-high, add the remaining tablespoon of olive oil to the pan along with the paprika, salt, black pepper, and cayenne. Sauté the vegetables with the spices for about a minute, until everything is well combined. Blend the can of whole tomatoes until slightly pureed - you still want some chunks of tomato in there. Pour about half of this into the pan and mix with vegetables to combine. Add as much tomato as you need to reach the consistency of a thick stew - you want to have more vegetables than sauce - and this will vary. Allow this to simmer for 10-15 minutes until the tomato has thickened and slightly reduced. Remove from heat and allow to cool for at least 10 minutes. Preheat the oven to 375 degrees. Prepare the puff pastry by placing it on a lightly-floured surface and rolling out any holes or broken seams. Cut the pastry into a round that is 1 inch bigger than your pan. Place the pastry round over the pan (if the pan is way too hot and you don't have time to cool it down, transfer your vegetable stew to another cool cast-iron pan), make one or more slits on the top to allow air to escape, and brush lightly with egg. Bake for 30-40 minutes, until the crust is richly golden brown and cooked all the way through. The only way I will ever cook a piece of fish is with a cast-iron skillet. If you want to know why the fish you've ordered in restaurants is so good, let me give you a foolproof and simple way to cook a simple thing: seared salmon. 1. Set your oven to a high temperature: 450-500 degrees. 2. Prepare fish. Make sure the bones are picked out. Leave the skin on. If you see scales on the skin, scrape them off or give it a quick rinse. Cut into 6-8 oz. portions. (You can ask the fish monger to do most of this for you at your local market). DRY the fish with paper towels - thoroughly. Salt both sides. 3. Heat a cast-iron skillet over med-high heat until it's nearly smoking. Add a couple tablespoons of olive/grape seed/canola oil. Place your fish into the pan, skin-side down and leave it alone. Don't touch it. Leave it! I'm serious. 4. Now you can touch it. Check to make sure it has formed a nice crust and that you can see it cooking/turning opaque from the bottom up. Once the skin is crisp and golden brown, grab the pan (yes, it will be hot) and pop it into the oven for just a few minutes - until it feels firm and springs back when touched on the top and sides. Some people wait until they see "white spots" on the salmon...this is now the point of overcooking, so please pull it out before that happens. You now have a beautifully cooked piece of fish with crisp skin - fish skin is so good for you, but so few people take the time to cook it well. Savor the moment and enjoy. Monterey County has been producing wine for more than fifty years, but many people are just discovering those wines for the first time. A wide variety of grapes are grown in the region, but their Chardonnay and Pinot Noir are an exceptional value. Wine Enthusiast Magazine named it one of the "Top 10 Wine Travel Destinations" for a reason! It is an exquisitely beautiful area with great wines and wonderful restaurants. 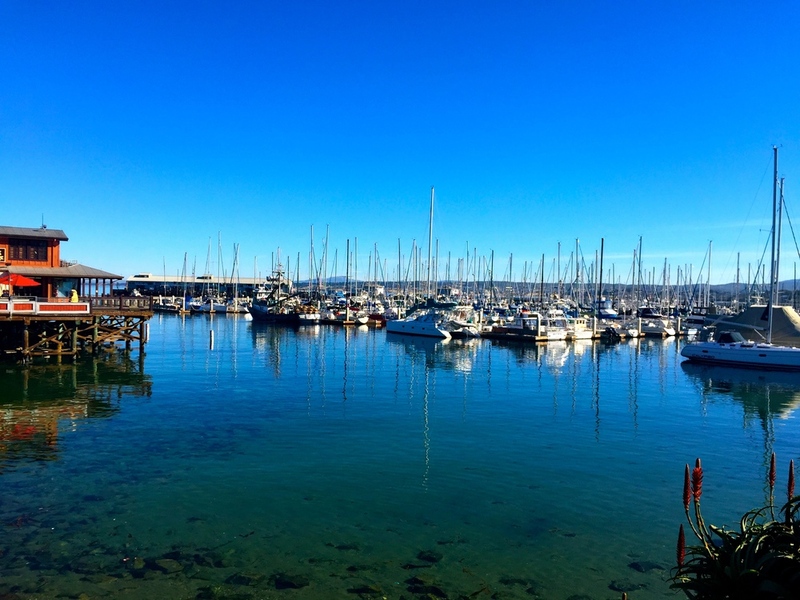 People often ask if they should stay in Monterey or Carmel. The two towns are, literally, right next to each other so you don't actually have to choose. Personally, I'd choose Carmel-by-the-Sea any day just because it's mellow and quiet - probably one of the better perks of getting out of the city, right? In Carmel, the best restaurant in town is Aubergine and it's connected to the best hotel in town, L'Auberge (Relais & Chateaux). For something more casual, head up to the rooftop bar at Vesuvio and order a margherita pizza. Or if you're in the mood for Spanish tapas, find a hidden table at Mundaka and enjoy a carafe of sangria while you're at it! The best oyster spot in town is A.W. Shucks Oyster Bar, but get there early to avoid a wait on the weekends. In Monterey, you'll find that it's a bit more commercial and crowded than Carmel, though still beautiful. The saving grace for me was the Cannery Row Antique Mall, which is one of the best antique malls I've been to in recent years. Fisherman's Wharf is sort of cute (read: touristy) and worth it to enjoy the view and some seafood. I'd rather send you to The Wharf Marketplace, which is right around the corner and is the perfect place to sip an espresso while you peruse the local goods. If you want to find the best restaurant in Monterey, it's Restaurant 1833. On a chilly night, enjoy some small bites in their Library next to a roaring fire or head upstairs to their Absinthe bar! If you're heading out to wine country, don't forget to stop at The Cheese Shop in Carmel to stock up on road snacks. For a small town, they have an impressive selection of cheese, wine, and gourmet foods. You'll also find some lovely charcuterie and other goodies at Salumeria Luca. If you'd rather stay closer to town and still do some wine tasting, there are some great tasting rooms at The Crossroads in Carmel, including Morgan Winery (excellent Pinot Noir and Sauvignon Blanc) and McIntyre Vineyards. Since you're over that way anyway, stop by Lafayette Bakery at The Barnyard and pick-up a baguette to go with your cheese! Talbott Vineyards and Bernardus Winery were favorites for their estate-grown Pinot Noir - and they are located in the same area. To map out your own wine route, take a look at the Monterey Wine Country site for a list of AVAs and vineyards. The Monterey County wine region isn't enormous, but definitely large enough for a whole day or two of tasting. If you'd rather sleep closer to the grapevines, look no further than Carmel Valley Ranch - a luxurious hotel and spa nestled in the Santa Lucia Mountains, which is also a nice lunch escape (or golf escape) to break up a day of wine tasting. 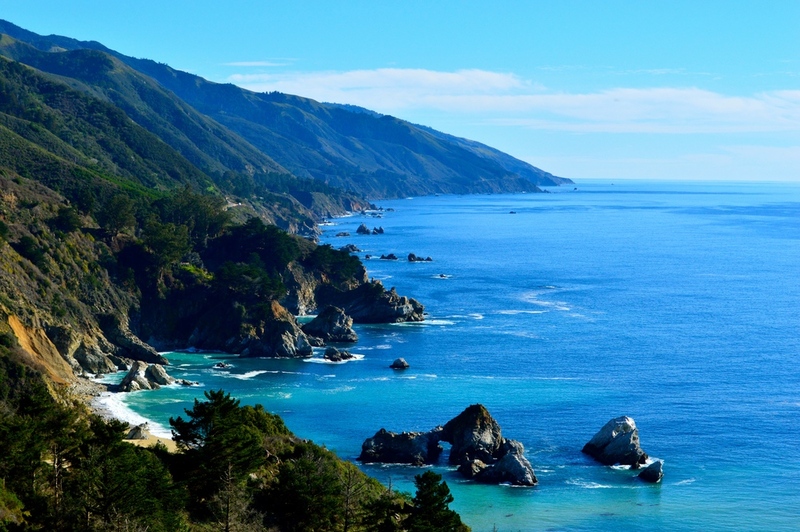 If you haven't already, don't forget to head south and take that famous drive through Big Sur! I'm not a big egg yolk person, and apparently this is considered blasphemy in my profession, but my guests almost always want theirs. If you're making several ramekins, just remember that they should all contain about the same amount of egg in order to cook evenly. This means that if you are removing an egg yolk from one ramekin, you'll need to add an extra white to make up the difference in volume. My recipe calls for two whole eggs per person, but egg servings are very personal, so tailor this recipe to you. 1. Heat a large skillet over medium-high heat. Add 1 tbsp. olive oil and mushrooms. Sauté until richly golden brown. Add garlic and cook for 1-2 minutes until golden and fragrant. Remove from heat. 2. Add the dill, basil, thyme, and a pinch of salt and pepper to the pan. Stir to combine and taste for seasoning. This mushroom mixture can be made ahead and will keep in the refrigerator for several days. 3. Preheat your oven's broiler and place an oven rack about 6 inches from the heat. 4. Crack each serving of eggs into small bowls (if you are using 4 ramekins, each with 2 eggs, crack 2 eggs each into 4 small bowls) - this makes it easier to pour the eggs into hot ramekins and also avoids broken yolks, egg shell pieces, etc. 5. Place four small cast-iron pans, gratin dishes, or ramekins on a sheet tray and place 1 tbsp. of butter or olive oil into each ramekin. Put the ramekins in the oven for at least one minute or until the butter has melted completely. 6. Remove the hot ramekins from the oven and pour each serving of eggs into each ramekin. Place a spoonful of the mushroom mixture over the top and add a few big shavings of Parmigiano-Reggiano or some crumbles of fresh goat cheese. 7. Put the ramekins back under the broiler. Cooking time will depend on the size/depth of your dish and how many eggs you've used. If your dish is wide and shallow, it could take just 3 minutes. A deeper dish may take 5-7 minutes. Keep your eye on it because it's super quick! 8. Garnish with additional fresh dill and serve hot. Champagne has been in the spotlight long enough, don't you think? There are so many other sparkling wines around the world that use the same grapes, the same method, and are worthy of toasting the new year! Your wallet will thank you later. This sparkling wine is made entirely from organic grapes and is very affordable at around $30 per bottle, making it one of my top picks. Domaine Carneros, located in the Napa Valley, is the American outpost of Taittinger Champagne, so it's no surprise that they produce some of the best sparkling wines in California. Don't let "Riesling" fool you. This wine is dry, delicate, and packed with flavor. At around $20, this is the most affordable sparkling wine on the list. Perfect if you're in the mood to venture out of your comfort zone! If you haven't already, check out one of my past posts on this wine region: Mosel & Rheingau: Riesling Royalty and a Tiny Volkswagen. This wine is known as one of the best examples of Spanish Cava on the market today, but is still remarkably affordable, and would be the perfect introduction to the country's version of Champagne. It's dry, complex, and elegant; best paired with pan con tomate, aged cheeses, and salmon tartare. Just like Taittinger, Moët & Chandon has a California outpost: Domaine Chandon. They produce excellent and affordable sparkling wines under the Chandon label, but they also produce a few exceptional (and a bit more expensive) sparkling wines under their étoile label. You absolutely cannot go wrong with either the Brut or Rosé and, as an added bonus, these beautiful bottles make a great host or hostess gift! Italy is known for Prosecco, which can lack complexity and be too sweet for many. Franciacorta, however, is Italy's best kept secret in sparkling wine. Winemakers in this region are deeply passionate about their product and this particular bottle is fresh, crisp, and balanced. This is one of my favorites. Since Champagne is a very protected term, it can only be used on wines produced in the region of Champagne in France. However, if you exit Champagne and take a few turns, you can find comparable French sparkling wines, using the traditional method, for 1/2 or 1/3 of the price! A French sparkling wine made outside of Champagne will be called "crémant" and list the region where it is produced. There are many wonderful crémants from the Loire Valley, Burgundy, and Alsace, but this one here is a little off the beaten path. It is from Jura, which is sandwiched between Burgundy and Switzerland. This bio-dynamic wine is unique, expressive, and aromatic. At less than $25, it's a steal! Poached pears are such an elegant dessert that can be made in advance and couldn't be simpler. It just requires peeling the pears, throwing everything into one pot, and letting it simmer. I love red pears, but you can choose your favorite firm pears. 1. Using a knife, cut a tiny bit off the bottom of each pear. This allows you to serve it standing up without it rolling over. 2. In a large saucepan or pot (just large enough to hold all the pears), combine the water, sugar, honey, and salt. Over medium heat, stirring occasionally, allow the sugar and honey to melt completely. The liquid should be clear. 3. Add the sparkling wine, cinnamon, and vanilla bean to the pot. Return to low-medium heat and bring to a simmer. 4. Place the pears in the liquid and simmer for about 20 minutes, until the pears are soft and tender, making sure to rotate the pears and stir the liquid occasionally. Remove the pears and transfer to a plate to cool. 5. Adjust the heat to medium-high and boil the poaching liquid for another 15 to 20 minutes, until it has reduced and thickened to the consistency of syrup. It should coat the back of a spoon. Discard the cinnamon stick and vanilla bean. Serve each pear in a shallow bowl and spoon some of the syrup over each pear. Serve with vanilla ice cream (or, better yet, cinnamon gelato) and a glass of sparkling wine! Note: If you can't find any small pears, use whatever you can. Just keep in mind that bigger pears will require a longer cooking time. To test for doneness, insert a butter knife or fork into the bottom of a pear. If it goes in easily and feels soft and tender, they're done! Celery root, or celeriac, is one of my favorite winter vegetables. It is low in calories, low in carbohydrates, and contains lots of beneficial vitamins and minerals, which we may not be getting from all those extra holiday cookies. Another one of my all-time favorite vegetables is fennel, which is filled with phytonutrients, fiber, potassium, and more! Together they make a richly flavorful soup that can be served either hot or cold. It is wonderful on its own, but can also become a more decadent meal with the addition of half & half or cream. 1. In a large soup pot, heat the olive oil over medium-high heat. Sauté the fennel and onion with 1 tsp. of the salt until soft and translucent, about 10 minutes. Add the garlic and cook for another 1-2 minutes, taking care not to burn the garlic. Deglaze with white wine and allow the wine to reduce by half. 2. Add the celery root, potatoes, and vegetable stock and bring to a boil. Once boiling, reduce heat to low and let simmer, partially covered, until the potatoes and celery root are tender and cooked through. 3. Remove from heat. To purée, transfer soup to a blender or use an immersion blender in the pot. It is always best to leave a few ladles of vegetable stock in the pot - you can always add more liquid, but can never take it away! Once the soup begins to blend, adjust the amount of stock to reach the desired thickness. Add in the remaining salt, pepper, and lemon zest. Taste for seasoning. Optional: Stir in 1/2 cup half & half or cream for added richness. Garnish each bowl of soup with fresh dill and/or celery leaves. Serve with good, crusty bread and enjoy!